Many people have asked why Somerset has no County Show, well now at last it has and in the county town of Taunton! The two-day event is now scheduled to be held at Taunton Racecourse on an annual basis, every September. Plans for the 2019 event, which takes place on 20 and 21 September, are well underway with a huge array of activities and displays already booked. The show is designed to showcase the very best that Somerset has to offer, with the emphasis on individual and community participation. As befitting the venue, equestrian enthusiasts will be well catered for, with polo and the Pony Club all represented, along with the hugely entertaining British trials and scurry driving team event – and The Shetland Pony Grand National, to name but a few. Field sports of all disciplines are included, with a challenging open clay shoot, gun dog scurries, fly casting, falconry, archery and air rifle range, with have-a-go facilities available under expert supervision. For dog lovers there are gun dog demonstrations and competitions, agility, exhibitions, and a fun dog show, so bring your dog on a lead with you! Tone FM are hosting a community stage providing up and coming entertainers, bands and choirs a chance to perform in public, so if you “have got talent” get in touch to book your slot! Celebrity chef Lesley Waters is hosting cookery demonstrations throughout the weekend and creating a range of dishes using local produce available from the many artisan producers in the food and drinks hall. There will also be plenty of street foods to enjoy, with local beer and cider provided. Classic and Vintage cars will be converging from all over the county, and no show would be complete without the smell and sounds of the steam engines. There are also plenty of activities for the children to enjoy, including a puppet show, fun fair, climbing wall, bouncy castles and ferret racing! If you are interested in being part of this prestigious event or would like trade space or sponsorship details, contact Sharon Mitchell on 07739 964843 or by email on sharon@somersetcountyshow.co.uk. The Westcountry Equine Fair held at Westpoint, Exeter, on 1 and 2 December was a great success for both exhibiting companies and the many competitors and displays taking part. This year organisers, Contour Exhibitions, saw a fantastic increase in the number of entries to the various competitive events, highlighting the enjoyment people derive from the Fair. Four Pony Club teams took part in the fast-paced Pony Club Horse & Hound Show Jumping Challenge, with Taunton Vale Harriers the winning team on Saturday 1st. Hattie Barnes riding Star from Tiverton Hunt Pony Club was the most stylish rider and Ruby Russo with Bess from Cotley Hunt Pony Club was the fastest runner. South Pool Pony Club were the winners on Sunday 2 December, with Poppy Burner riding Puff from South Pool Pony Club being the most stylish rider and Jasper Kolowski (Silverton Pony Club) being the fastest runner. The unaffiliated Quadrille Competition is in its second year and the quality of performances was absolutely amazing. Cornwall Trec Group was the winning team this year with their theme Sister Act at the Moulin Rouge (see photo). Imagine being a young rider competing in front of a large crowd. 14 youngsters did just that and they were amazing. The Junior Show Jumping Competition sees children 14 years and younger on ponies 13.2hh and under jump a course. Alfie Diaper, age 9, riding Buddy II, was first and also claimed the prize for the most stylish rider; Finlay Adams, age 13, riding Doylan Fairy Footsteps, was second and also best turned out; and Ella Stephens, age 11, riding Amees Flame, took third place. The Best of the West theme ran through, with some amazing displays from stars from the West of England including John Chubb, Tim Cheffings and the Indoor Driving trials. This year also saw a large number of new equestrian companies and new products at the show, as well as the old favourites. We look forward to seeing them all again in 2019. The event is going from strength to strength and we are looking forward to more fun in 2019. The dates are Saturday 7 and Sunday 8 December at Westpoint in Exeter. The Westcountry Equine Fair this weekend welcomes the return of the unaffiliated Quadrille competition and is set to bring glamour, colour, fun and story-telling once again! The Westcountry Equine Fair takes place on Saturday 1 and Sunday 2 December at Westpoint in Exeter and is delighted to host the quadrille competition, which will take place on the Saturday of the show at 2.15pm. Six teams will take part: Blackdown Hills Riding Club; Brent Knoll Riding Club; Cannington Equestrian centre; Cornwall Trec Group; East Devon Pony Club and Friends of the Dartmoor Hill Pony. All the competing teams have chosen some amazing themes for their display. Each team will have four riders and the displays to music will last five minutes. 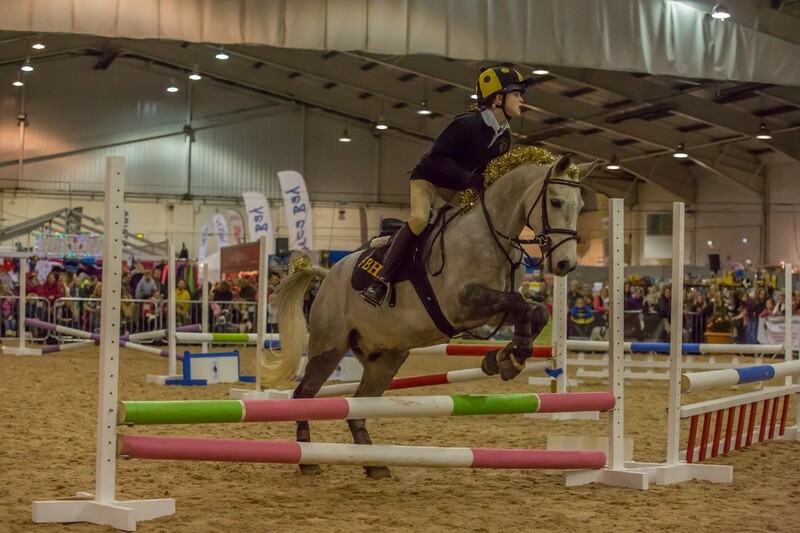 The Westcountry Equine Fair is well known for its competitive elements, with the horse & hound show jumping challenge now on both show days and the junior show jumping competition on Sunday. Both have been running for a number of years and have proved very popular. The Junior Show Jumping Competition has 15 competitors, all 14 and under – an amazing platform for them. The horse & hound pony club challenge has four teams of four riders and four runners with dogs, a fast-paced and fun-filled challenge for both teams and the audience! The show is not complete without the amazing equestrian shopping village. Stay stylish with the latest fashions, keep up to date with new products and excellent advice and of course plenty of the main brands, show offers, competitions and book signings. With over 200 companies, this is a great equestrian shopping experience for the horse and for the rider. Don’t forget you don’t need to carry those heavy shopping bags around, as there is the shop-and-drop facility in the foyer – all donations to South West Equine Protection. To book your tickets in advance and save money visit www.westcountryequinefair.co.uk or call 01392 421500 (office hours) and follow on Facebook and Twitter to stay updated. Brompton Regis Show & Gymkhana (Brompton Regis Cricket Field, Renford Knap TA22 9NJ) will be celebrating its 65th birthday on 18 August, with lots to enjoy for every member of the family (and for dogs, horses and ponies too!) . The show opens at 9am with show jumping when the refreshment tent will also open for teas, coffees, cakes, etc. The exciting Gundog Scurry sponsored by Hollam Shoot starts at 10.30am and the ever-popular Dog Show starts at 12.30pm with pedigree classes, followed by family fun dog classes at 2.30pm (all times are approx.). Entries for all Scurry and Dog Show classes are taken on the day – so bring your dogs and have some fun! The exhibits tent opens at noon, with amazing displays of flowers, vegetables, cookery, handicraft and eggs. The children’s area and stalls open at 10am with a Bouncy Castle. Face Painting will start at 11am. Enjoy our vintage tractor display, coconut shy, bric-a-brac, plants, books and bottle stalls, tombola, raffle, etc., and our Auction of Promises (opening at 11.30am) will have some magnificent offers waiting for your bid. For the first time we have the Somerset Red Arrows Majorettes performing in the refreshment area at approx 2.30pm. The Horse Show and Gymkhana will be a full day event with lots of classes, from jumping, showing (including Exmoor Ponies) and fancy dress, to the excitement of the gymkhana to cheer on. (Entries for all classes are taken on the day.) And don’t miss our traditional Parade of Hounds at approx 2.30pm. At around 3.30pm, the Auction of Promises winners will be announced, followed by a very entertaining auction of tempting produce from the various exhibits. Not to be missed! On Sunday 7 January over 80 pupils from primary and secondary schools in the area took part in the fourth round of the 2018 North Devon Schools Show Jumping League. Despite the freezing-cold temperatures and howling winds, every competitor rode with high spirits and did their school proud. The 50cm team class was won by the Ilfracombe Academy Divas, with their team member Aimee Hearnden taking the individual win on her pony, Champion. Great Torrington’s Flying Fillies jumped above the other 10 teams in the class to win the 60cm, whilst West Buckland’s Bethany Gay and Rocky went on to win the individual section. The competition then moved on to the 70cm team class where Great Torrington’s second team, The Day Dreamers, took the win, with their team member Megan Cole, riding her pony Mr Finley, also winning individually. The 80cm class was action-packed but South Molton Community College’s Team Storm jumped their socks off to beat the rest of the class. Braunton Academy’s Lilli Fiddes, riding Miradays Luigi, took the individual win. The final class of the day was the 90cm where there was some fantastic sportsmanship. The Bideford Blazers from Bideford Community College walked away with first place. In the individual section it was another win for Great Torrington’s Megan Cole, this time riding her pony, Something Nice. The organisers would like to thank their sponsors Torch Equine Vets and Devonshire Motors for their support and generosity. Round 5 of the North Devon Schools Show Jumping League will take place on 4 February. More info on how you can support or take part in the league can be found at Coxleigh.com. Imagine performing as a young rider in front of a large crowd in an arena. The competitors in the Pony Club horse & hound show jumping challenge will do just that at Westpoint this December. Introduced to the annual Westcountry Equine Fair nine years ago, the challenge now has a dedicated following from both pony clubs and audiences alike. The Westcountry Equine Fair takes place at Westpoint in Exeter on Saturday 2 and Sunday 3 December. The event, now in its 21st year, is pleased to announce the four pony club teams taking part this year are: East Devon Hunt Pony Club; Lamerton; Polden Hills and Poole & District. The clubs will compete against each other in this fast-paced and thrilling competition. Riders will jump a course followed by runners and their dogs. The Pony Club has a long tradition of being the starting point for a large majority of equestrian team members and medal winners including this year’s stars Grant Bazin and Alexander Bragg. Not only does the Pony Club offer nine exciting disciplines including Eventing, Dressage, Polocrosse and Tetrathlon, but it also provides instruction in horse care and riding for people up to 25 years. No Pony? No problem! You can join in the fun at one of 500 Pony Club centres across the UK. So if the Pony Club challenge at the Westcountry Equine Fair inspires you, then look up your local Pony Club for more information. In addition to the unrivalled entertainment, the Equine Fair also features a dedicated shopping village ‘for the horse, for the rider and for Christmas’, with over 200 companies offering helpful advice and great show offers on 1000s of products for horse and rider including many big name brands including Joules, Ariat, Toggi and Thorowgood. Also look out for the BETA Equestrian Knowledge Zone in hall 2. Don’t forget you don’t need to carry those heavy shopping bags around with the shop and drop facility in the foyer – all donations to Devon Air Ambulance. This is certainly the total equestrian experience for the dedicated rider! To book your tickets in advance and save money visit www.westcountryequinefair.co.uk or call 01392 421500 (office hours) and follow the event on Facebook and Twitter to stay updated. The well-known Exmoor Pony Centre, operated by the charity Moorland Mousie Trust, is facing imminent closure after trustees revealed a downturn in financial revenue. They have launched a Crowdfunder Appeal which has to reach its £20,000 target by 2 June. The Moorland Mousie Trust, based near Dulverton on Exmoor, helps unwanted moor-bred Exmoor pony foals facing slaughter each autumn and operates a dedicated centre for their promotion and protection. Opened in 2006, The Exmoor Pony Centre was a dream that the charity’s founders had after seeing the plight of these rare and endangered foals. Since then over 50,000 visitors have discovered the wonderful native Exmoor pony breed and over 300 moor-bred foals have found a future either as riding ponies or within conservation grazing herds throughout the UK and abroad. The Exmoor Pony Centre provides a vital service for the free-living Exmoor pony herds. With closure, not only would the foals have nowhere else to go but also public access to the breed would end. This unique interaction and opportunity to ride, developed over the last 11 years, fulfills a vital need in marketing the breed and encouraging future sales and support for the ponies. In an attempt to prevent closure, a Crowdfunder Appeal is being launched to raise funds, organised by volunteer Gail Cheeseman. The Appeal was launched on April 21 on Crowdfunder.co.uk. So many people and ponies have benefitted from the work of the Centre and although the charity Moorland Mousie Trust will continue, with a much smaller and less effective presence, the closing of the Centre will be a blow for all future foals bred on Exmoor. To help or register your support, log on to www.crowdfunder.co.uk/save-the-exmoor-pony-centre and pledge whatever you can. There are some great rewards on offer by donation through the appeal site and a video showing the work of the charity and Centre. You can also see some of the cute foals, all of which have had nowhere to go. The charity will also be pleased to accept donations by post and over the phone. PHOTO: Taken for Exmoor Magazine by Jane A. Mares. Tuesday 4 April saw the first leg of the new North Devon Schools Show Jumping League, held at Coxleigh Barton Equestrian Centre, near Barnstaple, where teams from South Molton Community College picked a hat trick of firsts in each of the four classes. Maisie Atkinson, riding It’s About Time took individual first in the 60cm class, and South Molton’s team Thunder won the 70cm class (Maisie Atkinson on It’s About Time, Anna Drury on Jet; Molly Matthews on Mystic Meg; Chloe Sanders on Tickled Pink). Team Storm (Maisie Atkinson on Little William; Izzy Breard on The Grand Sort Jury; Molly Matthews on Million Dollar Girl; Grace Sinclair on Cregg Surprise) took first place in the 80cm and 90cm classes. Schools competing in the League included the Community Colleges from South Molton, Chulmleigh, Pilton, Park School, Holsworthy, Torrington, Bideford, The Gateway Federation and West Buckland School. The under-11 years were also represented by The Chulmleigh Cubs and The Shirwell Shooting Stars. Each of the four classes included a team and also had a number of individual entries – a total of 58 combinations jumped as individuals throughout the day. The South Molton Community College pupils also picked up a number of additional individual rosettes. The series is the brainchild of Vicky Fiddes and consists of four monthly competitions to be held at Coxleigh Barton, Barnstaple, and Mullacott Event Centre, Ilfracombe, throughout the summer of 2017. Mrs Sherwood, South Molton Community College’s team coach, said, “How amazing that we had such a winning streak on our first time out. I know that most of our young people have experience of riding for the Dulverton West Pony Club and this seems to have stood them in good stead in the first leg of the League. Well done to all of them, some of whom are on new ponies for the 2017 season. They rode very well, looked smart and were a credit to our sponsor Acorn Saddlery, who kindly donated the numnahs and sweatshirts, in the school’s new purple livery. And you can follow the League on Facebook. PHOTO: Team Storm. Left to right: Molly Matthews, Izzy Beard, Grace Sinclair and Maisie Atkinson. Four lucky people have been selected to take part in the Geoff Billington demonstrations on each of his morning slots at this year’s Westcountry Equine Fair. The event, which takes place on Saturday 3 and Sunday 4 December at Westpoint, Exeter, will see Zoe Coombes and Taggy Forseter-Bennett appearing on Saturday and Sammy Cotton and Asha Smith appearing on Sunday. Zoe Coombes , from Newton Abbot, is 23 and with her horse Chamora S, a 16.2hh grey, 9 year old warmblood, has competed up to 130cm jumps and has won National Amateur second rounds. Taggy Forester-Bennett is 19 years old and from the Honiton area. She specialises in eventing and is currently competing her horse IBonza Moorabinda (Moo), a 16 year old thoroughbred bay mare at BE Advanced and 3*. The show jumps at these events are 130cm. Watch Geoff put these willing students through their paces in each of the morning demonstrations. Geoff has a wealth of experience in the industry. Riding since the age of 11, Geoff has represented Great Britain in European and world show jumping competitions and the Olympics. The Westcountry Equine Fair, now in its twentieth year, hosts a wide selection of educational, competitive and entertaining demonstrations in both the indoor and outdoor (marquee covered) arenas including: Geoff Billington, Jonathan Marshall Horseback Falconry, Welsh Pony & Cob Society, Musical Ride, Sirona Therapeutic Horsemanship; Junior Show Jumping; Show preparation and showing lectures, a native breed parade and many more. There will also be the BETA sponsored Equestrian Knowledge Zone. You can ask advice from a selection of experts including: equine vet; equine dentist; Lorinery; referral farrier; equine nutritionist and free hat and body protector checks and worming. The show is not complete without the amazing equestrian shopping village. Stay stylish with the latest fashions; keep up to date with new products and excellent advice and of course plenty of the main brands, show offers, competitions and book signings. With over 200 companies, this is a great equestrian shopping experience ‘For the horse, for the rider and for Christmas’. Don’t forget you don’t need to carry those heavy shopping bags around with the shop and drop facility in the foyer – all donations to Breast Cancer Care. This is certainly the total equestrian experience for the dedicated rider! To book your tickets in advance and save money visit www.westcountryequinefair.co.uk or call 01392 421500 (office hours) and follow the event on Facebook and Twitter to stay updated.